Identical to the known karst limestone, barren, hot, dry and craggy rocks tend to robustness white. Karst area Bantimurung Bulusaraung National Park has long been known as the limestone mountains that kept many potential range of distinctive and unique. These characteristics would have been able to invite a variety of disciplines and among the parties to maintain sustainability, manage and use for various purposes. One area that many tourists are attracted Bantimurung Natural Park which is located in the Maros district of South Sulawesi Province. Having a beautiful natural potential, as a place of cultural tourism, and is a habitat for more than 84 species of butterfly, which was dubbed the Kingdom of Butterflies. Waterfall Bantimurung believed to have efficacy as a medical therapy, is an interesting natural attractions that have many invites visitors to come and enjoy the coolness and the efficacy of the waterfall. Bantimurung Bulusaraung National Park in cooperation with the local Department of Tourism and Culture to manage the area as a place of recreation and education, while supporting the empowerment of communities in the management of Natural Park in order to increase income and welfare. On the other hand, the society to preserve, protect and defend the region in a sustainable manner. Among the steep cliffs of karst mountains in TN Bantimurung Bulusaraung (Babuls) Pattunuang clear flowing river, through the midst of a tourist park has an area of ​​about 1624.25 ha is. The river has the appeal of waterfalls as high as approximately 10 meters by 8 meters wide. Waterfalls Bantimurung famous since the arrival of Wallace and serve as a conservation area since 1919. Now attract much attention of visitors, especially teenagers and children have fun in the water bath nan cool waterfall. From the waterfall that visitors can do like arum rapids by using tires provided by the tenants of the surrounding community with a relatively cheap price. Following the swift flowing water among the rocks padas, while others can swim or play on the edge of the shade by shade trees around it and is relatively safe. Waterfalls Bantimurung does look beautiful and attractive, natural surroundings with a cool air facilities and other infrastructure are adequate to make visitors feel comfortable. Even from some visitors who had met said frequent bathing under the waterfall, their opinion is a therapeutic waterfall in maintaining the health and stamina. The attractiveness and potential seems to be the gift that has been delegated by Him to us to be retained, conserved and managed and utilized sustainably. About three hundred yards from the waterfall, there is an area as a habitat for 84 species of butterflies with a variety of attractive colors. Place by the community known as Kesikebo (white sand), in the sand at morning and afternoon many visited by thousands of butterflies that often form groups or rows on the banks of the river between the three-meter-high waterfall (known as the Waterfall Bantimurung 2). The number of butterflies with different types of color and beauty, the region is dubbed as the Kingdom Of Butterflies, which are not found anywhere else in the world. Potential wildlife such as butterflies, especially the kind that is not protected is one of the capital that can be utilized by surrounding communities. With the expertise of individual butterflies are used as souvenir items, either in the form of a variety of ornaments and key chains and so forth. Souvenirs are sold in the parking lot of TWA in neat rows between traders of one another. Butterfly t-shirts illustrated with various designs and styles and sizes adorn many souvenir stalls and the prices are affordable by the general public. Maros-Pangkep Karst region is the second largest after the karst located in southeast China. 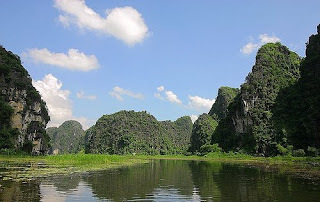 Karst mountains surrounding Natural Park Bantimurung shaped like towers, either in groups or standing alone. Is a unique form with its own charm, has a distinctive characteristic among the lush expanse of rice fields in the vicinity. The area is known as The Spectacular Tower. High-rise towers like a natural with a beautiful textured walls. Natural beauty is so captivating and hard to find in other areas, and has a unique geomorpologi second to none in Indonesia. Landscapenya specific and has the most beautiful cave ornaments as well as having the highest biodiversity in Tropical Asia. Its location is very strategic and easy to reach from the towns around it, within 42 km from Makassar City and takes about an hour, while from Hasanuddin Airport is about 21 km. Bantimurung karst mountain scenery has attracted many tourists to visit and enjoy the nature. Among kokohnya limestone mountains, it would save the potential for very attractive for tourists with special interests. Recorded about 400 caves in the karst region, 89 of which are prehistoric cave as a relic of early humans who ever lived, and lived in the cave thousands of years ago. Goa contained in TWA Bantimurung include Stone Goa, and Goa is visited by many dreams especially students and students or teenagers who like to travel with a pretty extreme challenge. Caves have stalactites, stalagmite, Flowstone, helektit, pillars and sodastraw. Textures and shapes is amazing, like carving a statue in the gallery, like crystal chandeliers hanging from, while the walls of the cave like a folded bergordyn beautiful and sometimes bumpy floors dry and soft sandy evenly as natural rugs, comfortable nan. Ornaments are known as ornaman most beautiful ever. Here pngelola put gatekeeper and guide services as well as torch light (flashlight) for visitors who want to know more about the cave. Which has a unique landscape and beauty is one gift that can be managed as a special attraction for tourists. It can also be utilized in order to empower the surrounding community. Obviously the management of the joint of the parties concerned, in order to maintain its sustainability on an ongoing basis. To support the existence of a natural attractions of course necessary that adequate facilities in order to attract visitors from various local and international tourists. TWA facility built by the local government through the Department of Tourism and Culture Maros Regency. The facilities available in a natural park, among others Bantimurung guest houses, gates and counters, meeting hall, stage entertainment, praying, swimming pool, shelter, information center, management office, toilets, tennis courts, out bond, flying fox, the road trail, security posts and polhut, with various kinds of souvenir shops, food stalls with a variety of cuisine, and ample parking area. Enchantment Natural Park Bantimurung as natural assets owned by the South Sulawesi Province, precisely Maros National Park Bantimurung Bulusaraung. Potentials that exist both tirta tourism, biodiversity and beauty of the cliffs karstnya as nature tourism with a special interest needs to be kept and maintained its existence. While the potential is presumably still hidden and have not been identified, need to be dug and carried peneltian further as the material development of the next tour. Karst region that has been proposed as world heritage, in particular the potential ornaments contained in each cave, need to be more protected from the hands of ignorant interference that could damage or contaminate the beauty and the like that occur during this time. Improving surveillance of every visitor who entered the cave, so as not to bring sharp objects, stationery, paint and the like which can be used to interfere with the presence of stalactite and stalagmite and ornaments that takes a long time in its formation.